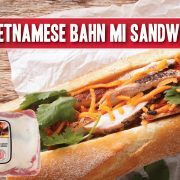 Sweet, spicy, citrusy, savory--this Vietnamese Bahn Mi sandwich has it all going on! 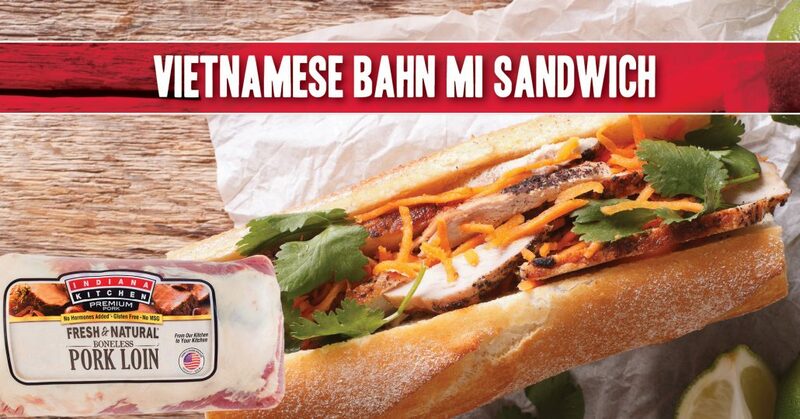 Try it with Indiana Kitchen pork loin marinated in a garlic-chili sauce! Cut pork tenderloin into thin slices. Sprinkle with pepper. In a large skillet, heat oil over medium heat. Add slices; cook 2-3 minutes on each side until a thermometer reads 145 degrees F. Combine the sweet chili sauce with soy sauce; pour over pork. Reduce heat to medium and stir until sauce is slightly thickened, 2-3 minutes. Then remove it from the heat. Combine lettuce and carrot with rice vinegar; set aside. When pork is cool enough to handle, slice into 2-in.-long strips; return to skillet to coat with sauce. Toast bread lightly, then spread with mayonnaise. Spoon pork evenly over the bread. Cover with lettuce-carrot mixture, cucumber, cilantro, green onions and jalapeno. Top with remaining sweet chili sauce. Fold bread and serve immediately with Sriracha sauce.